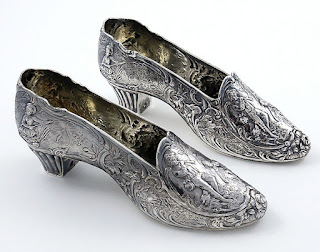 Dated 1898 and 1902 this pair of antique silver shoes were made by a well known silversmith in Hanau, Germany. They are quite large and heavy and have romantic figures and scenes in considerable detail. The hallmarks tell us that they were imported into Britain by a retailer Bethold Mueller who had them assayed and had the import hallmarks put on.